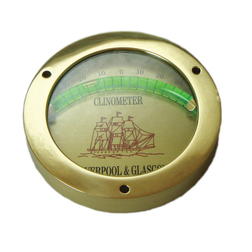 A brass bubble clinometer with accurate bubble gauge, clear measurements, decorative nautical design and glass screen. This brass bubble clinometer with accurate bubble gauge, clear measurements, decorative nautical design and glass screen is used to measure the angle of tilt. The brass clinometer makes an ideal gift, offering something a little bit different!